I read this article and found it very interesting, thought it might be something for you. The article is called How Grand Alliance Turned Vote Share To Seats In Bihar and is located at https://archive.indiaspend.com/bihar-votes-for-its-and-indias-future/how-grand-alliance-turned-vote-share-to-seats-in-bihar-86633. All the constituents of the victorious Mahagathbandhan (Grand Alliance) – the Rashtriya Janata Dal (RJD), the Janata Dal (United) and the Congress – managed to register a share-to-seat multiplier of more than 4 in the recently concluded assembly elections in Bihar. The share-to-seat multiplier of the Bharatiya Janata Party (BJP) dropped to 2 for the first time in 15 years in the Bihar assembly. The share-seat multiplier is calculated by dividing the seats by the percentage of votes a party gets. The multiplier indicates the ability of the party to convert a ‘percent of vote’ into ‘won seat’, which is the ability to convert votes – the basic unit of political equality and popular democracy – into seats. For example, for a party that wins 25 seats with 10% vote share, the multiplier is 2.5 (25 divided by 10). For a party with 15% vote share and three seats, the multiplier would be 0.2 (3 divided by 15). Put simply, a higher share-seat multiplier represents higher electoral efficiency as explained in Indiaspend’s earlier article. While the share-to-seat multiplier for the RJD and the Congress moved up from around 1 to above 4, the JD(U) and the BJP saw their multipliers decline in the 2015 elections. BJP, despite being the single largest party according to vote share, won only 53 seats, registering a share-to-seat multiplier of 2.2. The JD(U) saw its multiplier decline from 5.1 to 4.2, mostly due to the fewer number of seats it contested. The Congress won more than 50% of the seats it contested – 27 out of 40, an improvement from four seats out of 243 seats contested in 2010. The JD(U) retained the maximum number of seats in 2015 from the ones it won in 2010. Out of its 71 wins, JD(U) retained 58 assembly seats. The party won eight seats from the BJP and three from the RJD. But it conceded 16 to the BJP and 24 to the RJD. The BJP retained only 31 assembly seats out of the 91 seats it won in 2010. The party took away 16 seats the JD(U) had won in 2010. On the other hand, it conceded 36– more seats than it retained – to the RJD and eight to the JD(U). 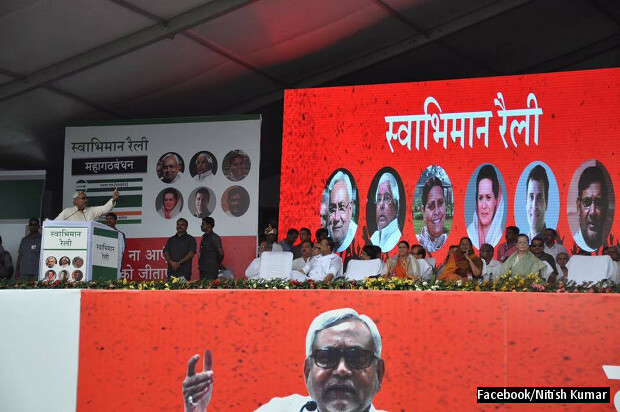 The RJD was the biggest beneficiary of the strategic planning of the Mahagathbandhan. It convinced the JD(U) to reduce its contest to 101 seats from 141 it had contested in 2010. The RJD contested an equal number of seats – 101 – along with the JD(U). The RJD became the single largest party by winning 80 seats while the JD(U) won 71. Only two candidates will enter the Bihar assembly with more than one lakh votes – the RJD’s Arun Kumar from Saharsa and the Congress’s Abdul Jalil Mastan from Purnea. Six candidates have won with a victory margin of more than 50,000 votes. Out of them, five belong to the JD(U) and one to the Congress. 32 candidates won with a victory margin of less than 5,000. While 14 belong to the RJD, 12 to the BJP and six to the JD(U). The RJD bagged 47 seats with a margin of more than 15,000 votes, followed by the JD(U) with 40 seats and the BJP with 14 seats.